May 2017 – Life Is Such A Sweet Insanity. I watched this interview with Hillary Clinton at Codecon live this afternoon. It was refreshing to hear someone with a presidential presence speak articulately and candidly. I’m still with her. Please set aside an hour or so and watch this interview. Earl and I have been working on cleaning out our storage areas throughout the house in preparation for our move to Chicago later this year. Earl has been leading this charge and every day he is tackling a closet or a cupboard or a long forgotten drawer. This weekend we worked together to disassemble some of my extraneous geek toys in the “server room” in the basement. We are probably the only house on the block that had a server rack holding two servers and two file servers with plenty of storage space. The two servers were old computers that had been repurposed for server use – one of the computers was date stamped 1996. An IBM Personal Workstation, it was a Pentium II/233 running Linux. Its task was to flip relays to run the clock system collection wired throughout the house. On the wall was a much newer master clock designed specifically for that task but I liked the idea of flipping relays via a program I had written. I relented and moved the control over to the master clock and decommissioned the ancient computer. The second server was an old point of sale terminal from an auto parts store repurposed to run Linux and provide “gateway access” to the network at the house. With today’s technology there are much better ways to get to our home network, so I decommissioned that server as well. 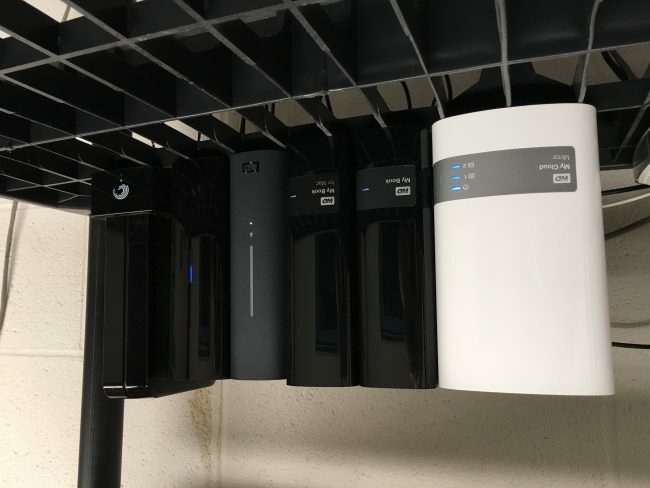 The two file servers provide backup capabilities for our computers when we are connected to the home network. They also hold the hundreds of hours of flight and other video I’ve taken with the GoPros. All of our music and photos are also backed up on these two file servers. This evening I went around collecting other external drives I had hooked up to various devices in the house and centralized all the storage. We now have nearly 20 TB of file storage in the house. It’ll take a lot of downloading to fill up that space. The hard drives are divided up between two little file servers designed specifically for this purpose. One day I’d like to take all the hard drives out of their enclosures and install them in a Drobo 5N2 so that everything is completely centralized and redundant. Earl can live with one little box sitting in the corner of our new home instead of a big server rack sitting in the basement. My life as an IT guy is never done. I like to think of myself as a responsible citizen. I encourage recycling. I’m respectful in public. I smile at strangers. I try to be a positive influence on the world. I live by my credo of giving more than I take from society. My life is wonderful. I have a wonderful family. I have the ability to pursue my passion of aviation and I have a good career. I go onto Twitter and see endless streams of idiocy from the Oval Office, with seemingly rational people normalizing abhorrent behavior that would resulted in fits of rage if the president was black. The news is a constant barrage of pearls clutching, hyperbole and exaggeration. I still don’t know why I maintain a Facebook account, though I do post on there much more than I should. It’s my own damn fault that Facebook frustrates me. I let it frustrate me. The thing is, when I see friends or family defend the sheer stupidity of the Trump administration I just get angry. The fact that a reality start that ran for the presidency as an attention seeking exercise actually became the leader of the free world through the enormous ignorance of the American people angers me. It angers me a lot. I’m also frustrated that the search for real estate has been reduced to “here’s a bunch of house you should look at on a website, let us know you’re interested.” The Internet has made so many people so lazy and ignorant. Technology was meant to enhance our lives, not reduce us to zombies without a single independent thought. Maybe I need to go watch a cat video or something. It’s a given that there’s been major leaps in technology over the past few decades. While computers have been around for my entire lifetime, it wasn’t until I was an adult that technology started coming into every aspect of our lives. I remember the excitement I had about technology when our local grocery store converted from big mechanical cash registers to relatively compact (for the time) electronic cash registers. These didn’t have scanning or anything, everything was categorized as it had been on the mechanical predecessors (Grocery, Produce, Meat, etc), but they could handle fractions, compute sales tax, weigh produce and had enough memory to store the price of a few items in their memory. Management could pull reports. And these little electronic marvels printed receipts that many folks could understand. There were no frills, a message, a list of the items and the total, amount tendered and change due. Thank you and please call again. 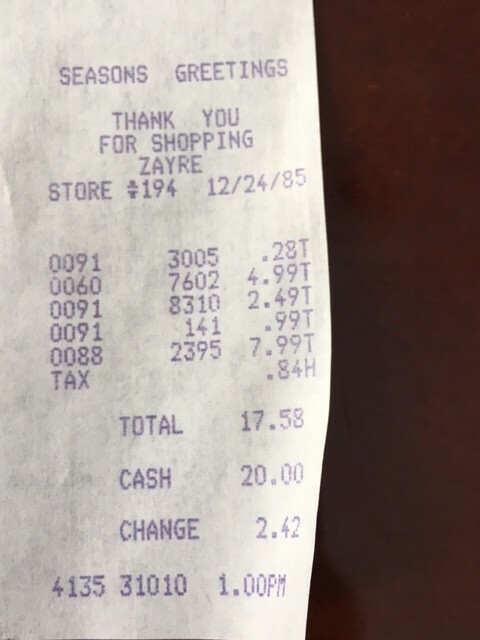 Here’s a sample receipt from my senior year in high school. This receipt from Zayre lists five items, tax due and the aforementioned important points that should be listed on a receipt. Seasons Greetings from Zayre. Easy peasy. The receipt is maybe two inches long, tops. The customer can match the numbers to the numbers on the item. There’s no paper waste. Fun fact, when I was writing code for a temp job at a department store, we made it a challenge to use a little receipt paper as possible, printing the “header” of the next sale as the paper from the current sale was being ejected. We wanted to save paper and save the store money. Now, here’s a photo grabbed from some random guy on the Internet. 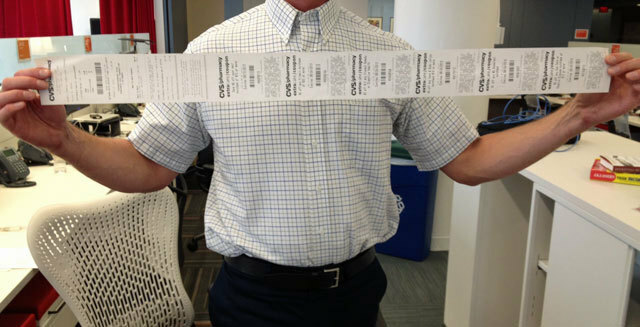 It captures the receipt that was spewed out of a modern CVS cash register when he purchased a pack of gum. Why on earth does a receipt need to be nearly two feet long for the purchase of one item? Who uses all these coupons? How many times do one need to see the store logo? Why do retail establishments feel they need to hammer me over the head with countless marketing messages from one purchase? Why the waste? What happened to be eco-safe and emissions free? Just because technology allows us to spew yards of paper at a rapid pace out of computerized cash register doesn’t mean that we have to do it. Who is this benefitting? The only positive result from this ridiculousness is the benefit to the paper company. How much of this paper is being wasted? How many trees are being cut to print out six CVS coupons for a pack of gum. This is not the direction I thought we’d be going in the 21st century. I really believe that technology is ahead of the general IQ of the population. We are capable of doing incredible things but we are literally wasting our bandwidth on stupid stuff. I know I sound like I’m chasing kids off my lawn but we really need to keep our use of technology reasonable and in perspective. Stop wasting paper. I’ve posted this video before but every once in a while I need to escape into some music and reset my center. There’s rarely a song that comes out these days that grabs my attention, but this track, released in 2013, nearly moves me to tears. Nostalgia? Perhaps. But it’s also a solid tune with amazing vocals. Here’s Gary Barlow (from Take That) and Agentha Fältskog (from ABBA) with “I Should Have Followed You Home” from 2013. Earl and I went to our local “Movie Tavern” over the weekend to see “Guardians of the Galaxy, Vol. 2”. The movie was enjoyable and we are looking forward to the next Guardians of the Galaxy cinematic adventure. Movie Tavern is one of those newfangled movie theaters where everyone has a BarcaLounger, a full service menu is offered and service staff can come and go at any time during the movie, all by request of a low-lit blue button mounted on the tray on the BarcaLounger. The tickets cost a little more and we often make reservations online so that we know where we are going to sit before we get there. For this particular outing we were in the middle of the theatre, three rows from top. Earl sat to my right. As we were getting settled into the BarcaLoungers and perusing over the menus, we noticed a family coming in to sit to our right. They were dressed in what I would call “grubby Gypsy” clothes. Mom had a lot of afghans and shawls over her skirt. An older gentleman had a scruffy beard, thick glasses and a very dirty baseball cap to go with his grubby clothes. There were a few others in mismatched attire from the mid 1970s Sears Wishbook. Immediately to Earl’s right was a younger girl with long hair who played on her phone every moment prior to any action on the screen. The aforementioned mother was content knitting. During the previews Earl moved his cup of soda from the cup holder and put it on my tray. Wild movement caught my eye; it seemed that the woman next to him was whipping her hair all over the place. She wasn’t in time with any sort of music. It took me a few moments to realize that she was having a seizure of some sort. I asked Earl if she was alright. He answered to the affirmative but then answered to the negative when I asked if he wanted to switch seats. The mother in afghans just continued to knit and the man with the ball cap slurped on his drink. Apparently this young lady’s seizure was no big deal. The thing is, every time there was a bright flash during the movie she went into another seizure. When you’re watching “Guardians of the Galaxy, Vol. 2”, there’s a few space battle scenes and every time a laser was fired or a torpedo was launched with great cinematic fanfare, this young woman started flailing in a seizure. Her hair whipped back and forth, her hands went in the air and she thrashed about like she was dancing some she-nay-nay. I didn’t feel bad for her as she clearly wanted to be there, but I felt bad for Earl because he was getting whipped with her long hair from time to time. I was worried that she was going to flip the BarcaLounger, or the food on her table and it was going to end up on Earl’s lap or something. I firmly believe that anyone, regardless of mental, emotional or medical capability, has the right to enjoy the entertainment of their choice as long as it’s not hurting anyone and aside from Earl getting hair in his cup and his “space” from time to time, this young lady wasn’t hurting anyone during her seizures. However, I couldn’t help but wonder why the rest of the family didn’t locate her in the middle of their entourage, for her safety and for the safety of the other patrons around her. What if the intensity of her seizure had increased during the movie? What if she fell out of her chair? I shared my BarcaLounger tray with Earl and we survived the ordeal. The seizures continued right up until the last space battle scene. When the credits rolled, the customer in question screamed “I am Groot!” every time the words were seen in the credits. Maybe she thought she was Groot. I guess I was a little stunned by the family’s lack of consideration for others but again, I’ve never been in their shoes so maybe I would have had the same nonchalant attitude that they had. I know that I wouldn’t have been knitting. Even though it’s only Monday, I’m exhausted by the news coming out of Washington, D.C. this evening. As a distraction, let’s listen to Alisha sing “Into My Secret” in 1987. So Earl and I are avid viewers of “Shark Tank”. 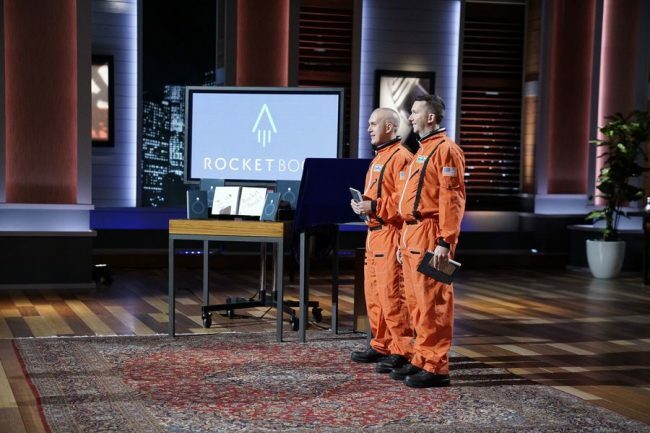 I’ve always been partial to episodes that include Barbara Corcoran as one of the sharks (I like the way she thinks, she’s way outside of the box and that’s awesome) and last night we caught up on the season finale off the DVR. Some of the products pitched on the show get my attention and last night one of the pitches was for Rocketbook, specifically the Rocketbook Wave. 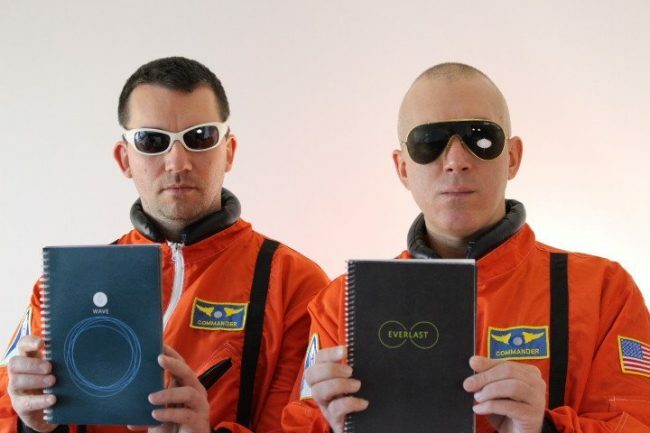 The Rocketbook Wave is a notebook designed to be reusable. Using a Pilot Flexion pen, you take notes like you would in any regular notebook. Using a free app on your iPhone, you can then instantly transfer those notes to the cloud service of your choice. It’s a “system” and it’s a well thought out system at that. When you’re done, you then microwave the notebook and all of the pages are erased. You can then use the notebook over again. Here’s a video explaining it. I am always torn between writing my notes in a notebook, because writing things down by hand helps me remember things and keeping all of my notes digitally. I don’t like wasting paper and I don’t like having to refer back to notebooks. I’ve tried writing notes by hand on my iPad Pro using an Apple Pencil, but it doesn’t feel natural to me and this “artificial pen and paper” distracts from the task of writing something down to remember it. So naturally I went ahead and ordered a Rocketbook Wave directly from their website. If you use this link to get to their website, you’ll get a special deal. I’m looking forward to my Rocketbook Wave and pen set arriving in the next few days. I’ll be posting a follow-up blog entry to let you know how successful I am with this note taking system that is ecologically friendly. Now, my only question is, where do I get Jake’s sunglasses? They are very Pretinama. In 1957 or 58 my grandfather moved his family out of their farm house and into the first floor of one of the three barns on their property. The floor had been renovated so that it was a decent living space. He then ripped the old farm house down and built a new home. The new house was designed by a man that owed the family business money. The custom design, which underwent one revision when my grandmother provided input on the kitchen, came to fruition and I believe my grandparents moved the family out of the barn and into the new house in 1959. The house was decidedly what we call “Mid Century Modern” today, with pocket doors, a judicious use of slate and brick on the interior and a large basement that had its own fireplace and large windows. 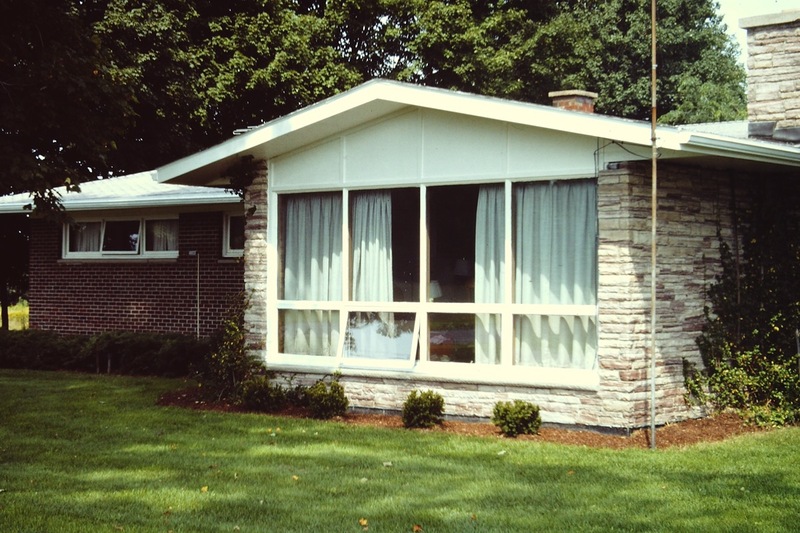 My fascination with Mid Century Modern began with this four bedroom, three and a half bath house that my grandparents called home for nearly 50 years. I struggle with seeing it in the somewhat run down state it’s in today; the guy that purchased the home from my grandfather’s estate using it as a camp of sorts. I like to remember it in all its glory.